* For instance imagine Y=exp(XB) and we want to estimate the Bs directly. 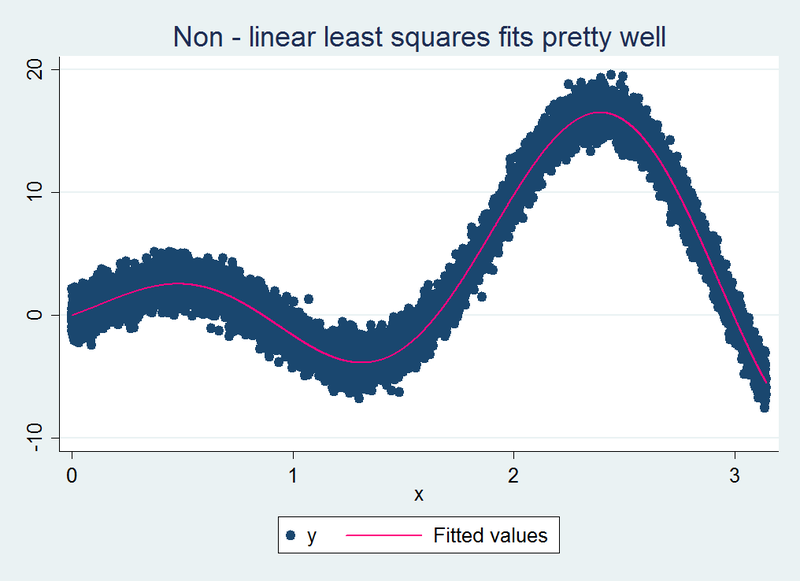 * Notice that the non-linear least squares estimate is pretty bad. * This is because the E(u)!=0, that is because E(normal())>0 and that by random error being enclosed in the exponential it means that the error is multiplicative. * The problem with a simulation like this is that we can estimate B without needing to use non-linear least squares. * An equation that cannot be decomposed into closed form. * These coefficients are not right (b0 or b1), but then again maybe they are because the sign function is symmetric and repetitive. * Thus two different input vectors could predict the same output. * Looking pretty darn good. * Of course this example is also very contrived. 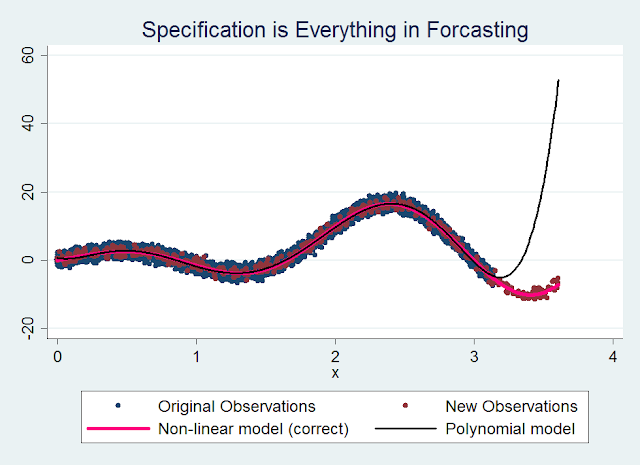 * Let's test how well the estimate performs when there is more noise in the model. * and we want to fit a polynomial to it. * Not too bad a fit at all! * But does a good fit imply a good forecast? * Let's imagine that the true distribution of x is truncated normal runiform()*_pi*1.1 and we only observed runiform()*_pi portion of it. * If we are using x to predict y in both these scenarios we will come to two ver different conclusions in our predictions. gen new_obs = 1 if x==. * This variable is newly observed. * Now let's see how our two models do. * Next we will redo the polynomial regression using the old values. reg y x x2 x3 x4 x5 x6 if new_obs==. * We need to make sure all of the x2, x3, ... xn polynomials are defined for the new observations. * This did not generate y_hat for all of the values. * Despite both models having very similar r2, the correctly specified one is much better at forcasting. * Thus every so often you hear about a group of financial wizards who are able to "predict" the stock market for a few time periods but then something changes and the models that looked so good to begin with end up generating lots of trash. "Closed form" - You mean linear in parameters? "This is because the E(u)!=0, that is because E(normal())>0 and that by random error being enclosed in the exponential it means that the error is multiplicative." - Well E[u] is definitely==0. You must argue via E[y].